Rather than being a missing link between man and the apes, Sasquatch may possibly be an alien species. This intriguing possibility is derived from evidence in several solid UFO cases. The earliest clues date back to 1888, when a cattleman described an encounter with friendly Indians in Humboldt County, California. They led him to a cave where he saw a hefty humanoid creature covered in long, shiny black hair, with no neck, sitting cross-legged. One Indian told him three of these “Crazy Bears” had been cast out of a small moon that dropped from the sky and landed.The “moon” then ascended back into the air. So it’s highly likely the “Crazy Bears” were really Sasquatch, and the “moon,” a spacecraft. Now fast-forward almost 100 years to 1973... and Mrs. Reafa Heitfield. She and her 13-year-old son were sleeping in a trailer in Cincinnati, Ohio on the morning of October 21. Reafa arose at 2:30 a.m. to quench her thirst, and noticed strange lights in the adjoining parking lot. Looking out the window, her attention was drawn, in particular, to an inexplicable cone of light, shaped like a huge bubble umbrella — about seven feet in diameter. Nearby she spotted a grayish, ape-like creature with a large, downward angled snout, no neck and a sizable waist. Moving slowly, it then entered into the light. About five minutes later, both apeman and UFO disappeared. Another dramatic incident occurred a few days later on October 25, 1973. A group of farmers in Fayette County, Pennsylvania caught sight of a dome-shaped UFO that was brightly lit and about 100 feet in diameter. As the locals drove toward it, they saw a pair of gargantuan creatures covered with thick, matted hair, luminescent green eyes and long arms that dangled below their knees. A farmer’s son fired a gun shot at the creatures, one of which raised its right hand in the air. At that very moment, the UFO disappeared. Then, the two Sasquatch escaped into the woods and were never seen again. Dairy farmer William Bosak of Frederic, Wisconsin was returning from a co-op meeting about 10:30 p.m. on December 9, 1974, when he nearly slammed into a globular UFO on the road in front of him, its bottom half enshrouded in fog. Inside the visible transparent dome was a six-foot-tall ape-like creature with reddish-brown fur covering its body (except for the face) and distinctive pointed ears. It appeared to be operating a control panel. As Bosak passed by, the object suddenly arose and disappeared. In August,1976, after a series of UFO sightings around Rutland, British Columbia, Canada, several men and their children saw a hairy ape-like entity, six to seven feet tall roaming about a mountainside. They also found a clump of hair that was sent to the Royal Canadian Mounted Police for identification. Laboratory analysis confirmed it was primate hair, but, significantly, it could not be matched to any known species on earth! 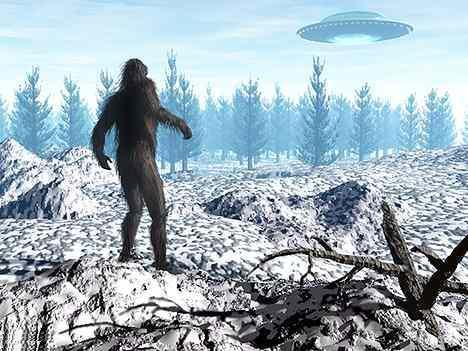 Perhaps the Bigfoot creatures are UFO pilots, landing on earth for exploratory purposes. Or, conceivably, higher level ETs are leaving behind some specimens as “guinea pigs” to test our environment for long-term survival. Or, possibly,these Sasquatch are criminal entities being deposited on Earth as a form of cosmic deportation! So is it possible that there is a connection between Sasquatch Encounters and UFO's reports? The data suggests yes, so you have to ask yourself, does Sasquatch as an alien traveling to planet earth in the dead of night explain encounters all over the world, and not just in the Pacific Northwest?